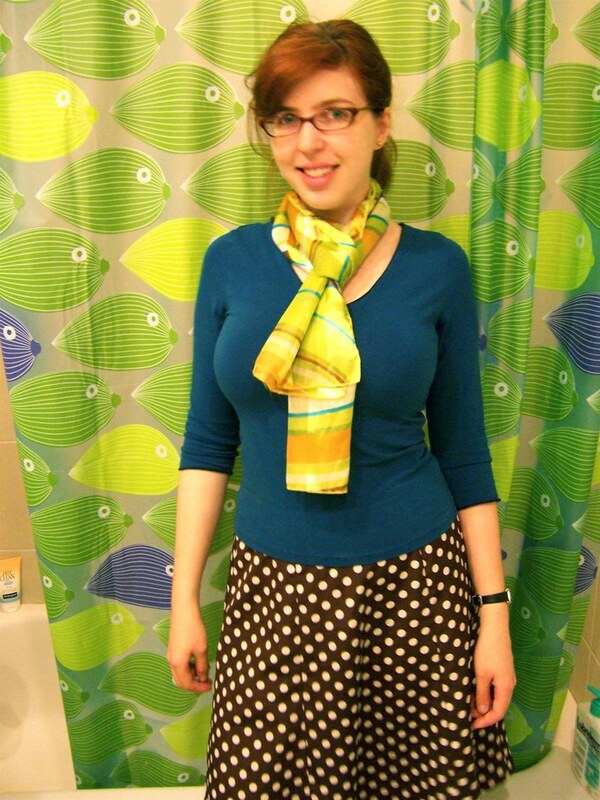 So: I made a plain solid-colored skirt in a neutral color with no embellishment. Somewhat out of character for me but I really needed this wardrobe staple to balance out all the wild print tops in my drawers. And, well, I love it! Post-baby #2, I can't squeeze into it any more, but when a thrift store denim skirt hunt turned up nothing good, I decided to turn to this well-loved TNT. When I first reviewed it in 2005 I answered the "Would you sew it again?" question with "Yes, I think I'll make again, since it's so simple. You can never have too many comfy skirts." And now I have and I'm so glad because I cannot stop wearing this thing! This time I made View B, the flared hem trumpet version. This is my ideal skirt. It's everything I love and need in a skirt for both my casual workplace (that I'll be returning to in less than a month) AND the playground — a spitup-proof cross between polished and casual, with the best features of a pencil and A-line skirt combined. 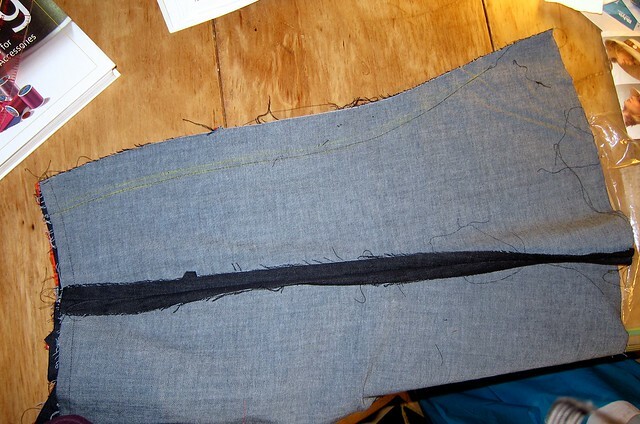 Fitted through the hips, but loose at the hem for running around. Tight but comfortable thanks to hidden elastic waist facing. Can sit on the playground floor or grass if necessary without fear of stains or showing my underthings. 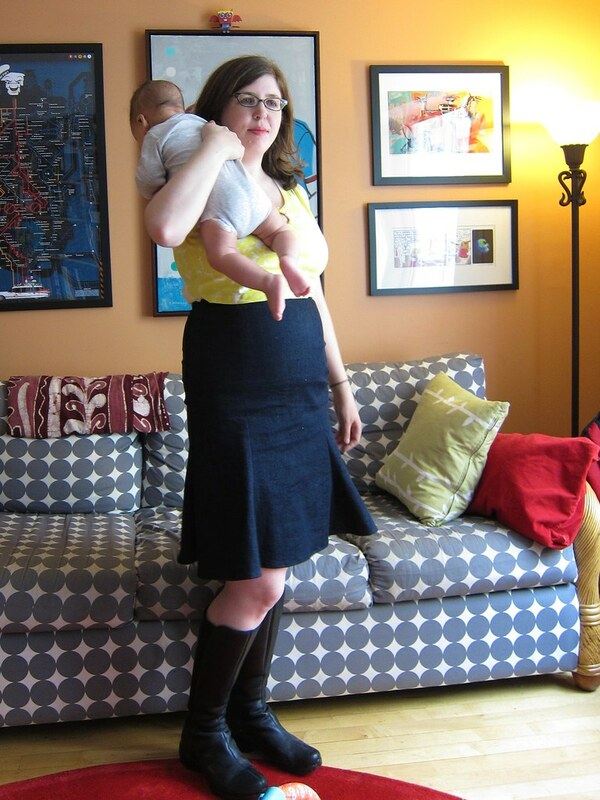 Stretch woven BUT with a "tummy tuck" or pocketless "pocket stay" style interior woven panel so I can wear my tops tucked in without fear of being thought still pregnant. Anyway, FINALLY not looking pregnant AND having an awesome new wardrobe staple is definitely a booster on the self-image front, and I'm feeling a bit better than I did in my previous post about it all ("What to Wear and Sew When Nothing Fits"). Taking Me Made May photos helps, even if posing always makes me feel super awkward (what the heck am I supposed to do with my camera-proximate arm? why does it look weirdly distorted?). 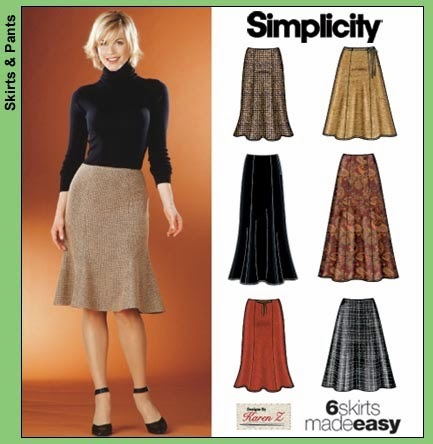 Pattern: Simplicity 5914 (out of print, but easily available on eBay), View B. A 6-gore woven fabric trumpet skirt with side zipper that hits at the natural waist. Fabric: Dark wash stretch denim from Mood, I think it is the Theory denim everyone raves about. When I saw Nettie of Sown Brooklyn recently she was wearing some amazing Ginger jeans in the exact same fabric. This stuff is AWESOME, the perfect medium weight with great stretch and recovery ... but I bought it in the store and have no idea which website item corresponds, sorry! Notions: 7" invisible zipper, hook and eye, 1" waistband elastic. Sizing: Since I can no longer squeeze into my size 14 version, I figured I would make the 16, but I forgot to factor in that I was using a stretch woven this time, so... OOPS. I basted the side seams, checked fit and wound up taking them in by at least 1.5" (so about 6" total) to get a nice snug stretch fit. I'm sure it would have been more accurate to take some of that width out of the gored seams, but I didn't feeling like it at the time—maybe I'll do that if/when I need to take the skirt in again. I used an invisible zipper instead of the lapped zipper recommended. I was going to use petersham for the waist facing (a technique covered in Sandra Betzina's wonderful Power Sewing: Step by Step book), but hated the idea of something rigid at my waist when my size continues to fluctuate... so I pretended that a piece of 1" elastic about 3" shorter than my waist circumference was the petersham and it totally works, even if it looks messy inside. 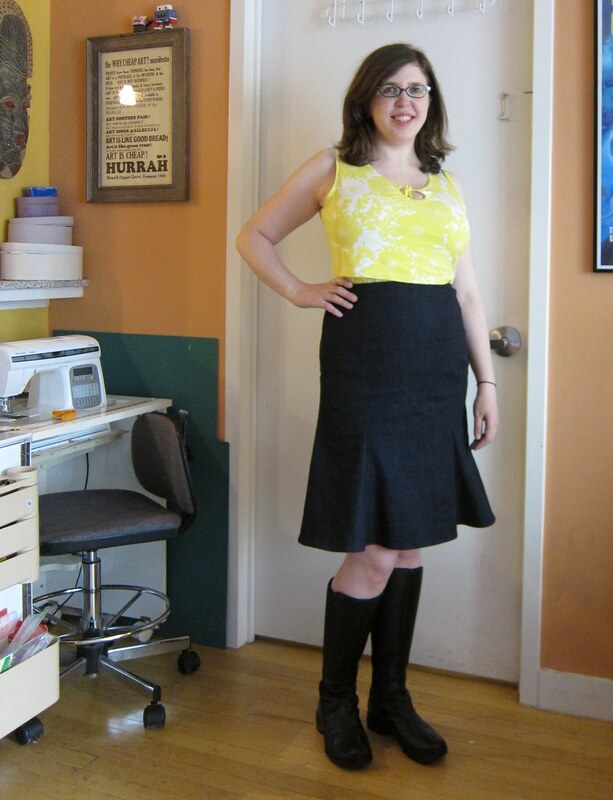 I sewed in a double layer of quilting cotton as a tummy tuck panel or pocketless "pocket stay" on the skirt front (I first got this idea from Fehr Trade blog, Heather Lou discusses it in her Ginger Jeans sew-along and Jenny/Cashmerette has blogged about it as well). The skirt has already passed the spitup test several times, and I was able to clean it no problem. Phew! Will I make it AGAIN AGAIN? Maybe, though I'm running out of time for sewing while on maternity leave and will probably be too tired to do much once I go back to work. This stretch cotton woven from the stash might do nicely, though the pattern matching might make me cranky. P.S. It is bizarre to think I first started sewing regularly 10 years ago. I did take a five year hiatus and didn't really pick it up again until 2010, but I still feel like somehow I should have more to show for 10+ years of owning my own sewing machine... but here I am, still making basic daywear skirts instead of, I don't know, tailored wool jackets and elaborate evening gowns. Maybe someday! Your skirt looks great! I'm also finding I sew more basics and simple silhouettes than fancy stuff. I think the pleasure of getting to wear basic stuff that fits and is the exact color/pattern you want is way more than making something complicated that I'll almost never wear. I was just about to say that a trumpet skirt is the best of the A-line and pencil worlds as I scrolled down to see you had written just that. ;) This is so cute--it looks like you can wear it with pretty much everything, and the shape fits you so well. I'm still waiting for that magical day myself when I can sew thinks like silk. For now, while I'm in constant danger of boys flinging dirt at me, I'll stick to knits and hard wearing things that I can move around in. I think the trumpet shape makes it anything other than a plain denim skirt. It's really cute. I love denim skirts. A skirt that fills a wardrobe gap and looks/works exactly as you wish is a sewing win. Who cares if you aren't pouring your time into making stuff that you won't wear IRL? I've been sewing for 35 years (middle school). I went through a period where I sewed what seemed like a logical progression. I've worn the two wool jackets once IRL. They are now too tight. What a waste of time and money. MMM helped me realize the gap between the clothes I need IRL and what I sew. Since the first MMM, I've made dozens of clothes that actually get worn. Yeah, that's the awesome thing about Me Made May. In fact, I just donated my only me-made jacket — it fit awkwardly and I never wore it. I have such a casual lifestyle, and my office dress is very casual (wearing anything fancier than jeans can make you stand out) so I have also gradually sold or donated most of my formal workwear and such over the years. I'm trying to build a me uniform so I look put together but feel comfy. I love the trumpet shape...so flattering and practical at the same time! I have to laugh thinking about all the times I answered the "will you make this again" question with yes, and then never touched the pattern again. Making garments that make you happy and get worn a lot is a total win! That's what MMM is all about, right? In the back of my head I'm always aspiring to be more chic and put together less sloppy. Slowly I'm starting to accept the ultra casual not quite matching thing that comes naturally to me and just build a wardrobe around that reality. That pattern has finally been discontinued? 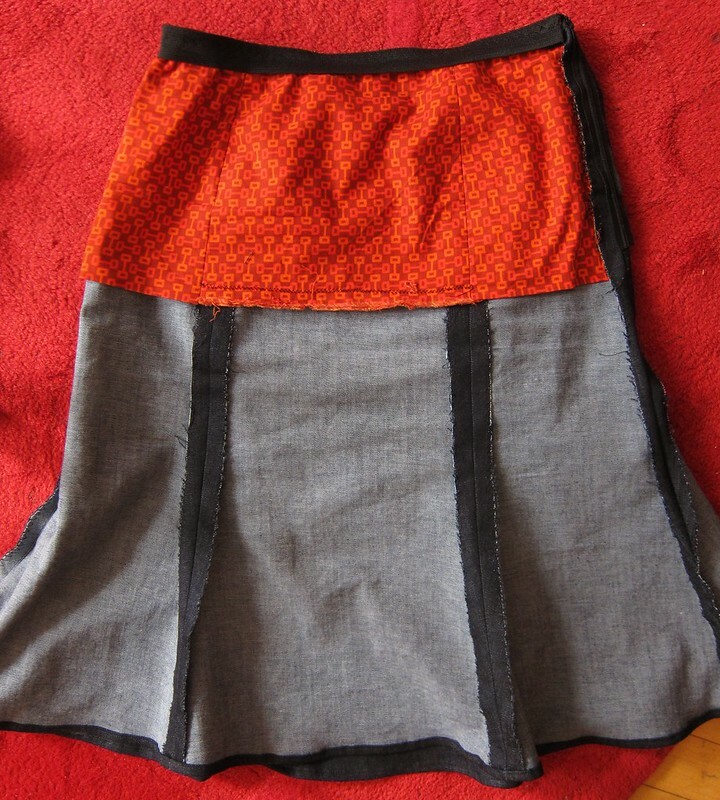 I made my first version about 15 years ago and it's a wonderful workhorse of a skirt! This looks good. You should definitely make another one! Also, you should cut yourself some slack on the amount of things you've sewn. You have two small children and I wasn't very prolific when my kids were small either!